Y'all have been subjected to an abundance of whining and gross pictures of my problematic tooth and accompanying abscess for awhile now - sorry. But you (and I) should be relieved that it's resolved. Yup. A nice oral surgeon yanked it OUT Thursday. Ah, but don't be feeling all complacent and making any assumptions that more gross tooth and gum pictures won't be forthcoming. There's lots of dental fun ahead, so stay tuned. Actually, there's a good probability that I'll be putting up all kinds of weirdo dental stuff while under the effects of pain pills..... I probably should have my blogging license suspended while I'm under the influence of narcotics for the next few days but that's not going to happen so brace yourselves. So before my appointment yesterday, I had my nose buried in a most interesting book written by Cristin O’Keefe Aptowicz. Imagine undergoing an operation without anesthesia performed by a surgeon who refuses to sterilize his tools—or even wash his hands. 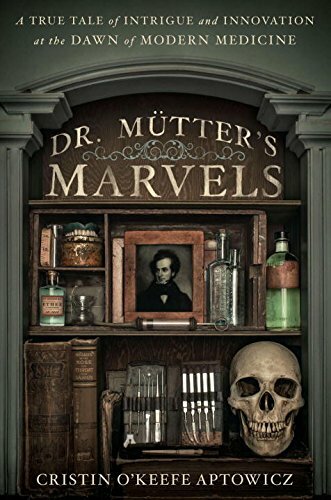 This was the world of medicine when Thomas Dent Mütter began his trailblazing career as a plastic surgeon in Philadelphia during the middle of the nineteenth century....continue reading here. I found it horrifying, gruesome, and totally disgusting. Yes. It is an AWESOME book. Terese and I had the good fortune to tour Dr. Mutter's museum awhile back - if you get the chance and aren't particularly squeamish, go. It too is pretty darned awesome. But the timing of my choice to crack open this book could have been better seeing as shortly afterwards I was sitting in a medical practitioner's chair facing a potentially unpleasant procedure. When the assistants wheeled in and opened up a sterile procedure pack and began setting out the tools needed, I couldn't help but sit up and take a peek. Whoa. Some of the instruments resembled pliers found in John's toolbox in the garage. As they began to prepare me for the extraction I was counting my lucky stars that modern anesthesia and sterilization had been invented; as comforting as that was, it didn't prevent me from recalling some of the cringe-inducing descriptions of surgeries found in Ms. O'Keefe Aptowicz's book. But before I could work myself into full blown panic, the offending tooth was out of my mouth. I felt enormously glad that this oral surgeon was so quick. And that he and I were both living in 2015. So now I'm popping more antibiotics and pain pills and chomping on sterile gauze with an ice pack slapped against my cheek. I'll gleefully share all of the gruesome details as this experience progresses but even though drugged up, I do have my limits - so don't be expecting to see any pictures of my face. Because that would be the most scary thing of all. Now it's time to count YOUR lucky stars.